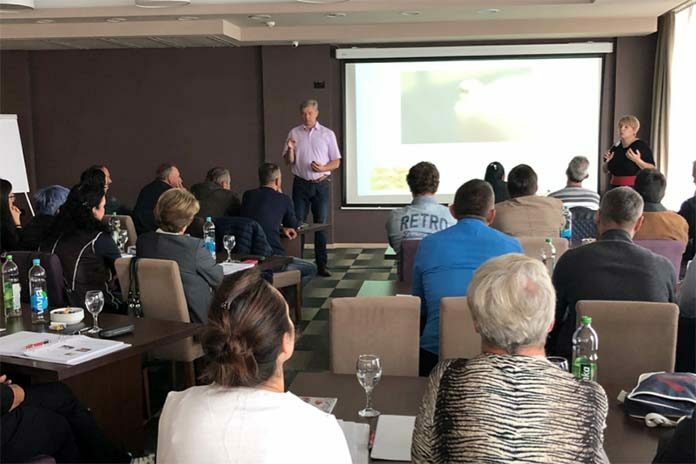 Iradia, Cobb Germany’s distributor in the area of former Yugoslavia, arranged the workshop offering another forum to provide customers with technical support, sharing in-depth knowledge of hatchery and breeder processes. Over two days, the Cobb Germany technical team, addressed various aspects of the incubation process and breeder management, exchanging ideas and experiences with the participants. Led by Dr. Ing. Ron Meijerhof, hatchery specialist at Cobb Germany, James Truscott, director of Cobb Germany, and Patrick van Trijp, senior account manager at Cobb Europe, the group discussed a wide range of topics, including egg storage, principles of incubation, chick quality, and the principles of breeder rearing and parent stock management. During the workshop, a practical hands-on training session was organized in the hatchery of Poljovet Zvonko Deronjic — one of the leading day-old chick producers in Bosnia. At the event, Poljovet was presented with the Cobb Champion Award for the outstanding results of producing more than 140 chicks per hen housed in several of their breeder flocks over the past three years. “It is an honor to present a much-deserved award to a loyal customer who consistently produces above-average results,” said Van Trijp. After the workshop, participants networked and were treated to a barbeque. 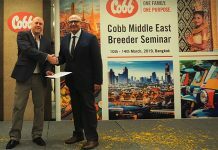 “These results are only possible with the professional help from the Cobb Germany team and I feel truly a part of the Cobb family,” said Zvonko Deronjic, director of Poljovet. “The demand for the Cobb500™ in this part of the world is quite remarkable,” said Biljana Tomić, general manager of Iradia. “Broiler customers of all sizes benefit from its production benefits, such as faster growth rate, lower FCR and the product’s ease of management,” said Biljana Tomić, general manager of Iradia. The regional hatchery and breeder workshop continues to grow each year, attracting more and more industry professionals. The 2018 session drew 45 participants, with future sessions expected to draw even larger turnouts. Next articleEggshell mottling, does it affect incubation results?